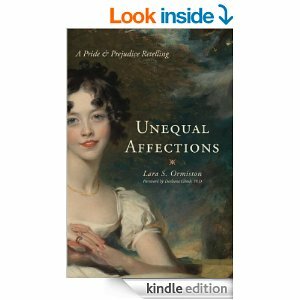 Unequal Affections is a retelling of Pride and Prejudice. It’s also one of the most beautiful, engrossing, and haunting books I’ve read. It’s clever, original, and enthralling. You all know how much I love novels both set in and written in the 19th century, and you also know I’m especially fond of character-driven novels, well, this is the most obsessively perfect character-driven novel I’ve read in a long time! Unequal Affections has very little by means of a plot, and there is very little action. On the other hand, the outcome is no surprise; we all know that Elizabeth married Darcy in the end! Yet, in spite of it all, this is a compelling, unputdownable read. I relished every chapter, every page, and every word, and I’ll no doubt be reading it again, because it’s a book to be savoured slowly and repeatedly. I was never Jane Austen’s greatest fan, and one of the reasons why I prefer contemporary renderings of Jane Austen’s works, is because she never got inside her characters’ heads. It is true that she portrayed her characters through ample conversation and actions, but to my post-Freudian mind, I really miss getting inside the characters’ minds, and understanding why they say and behave the way they do. It’s probably my fault. I may lack imagination, or knowledge of the era, but I need the characters to tell me why. Another fabulous aspect is how the author gets inside both their minds with equal balance. It would have been easy to give a one-sided account of how Elizabeth feels, with some hints at Darcy’s predicament. Some may argue that this is what Jane Austen did herself. However, the author gets into Darcy’s mind just as easily and convincingly as he gets into Anne’s, which is no easy feat, as his point of view is far more difficult to both ascertain and convey. The best part is how both characters evolve in just a month their courting lasts, and even better is how the reader also evolves with them. I felt I saw all the characters in a new light, because although we are given Elizabeth and Darcy’s points of view, we are given insights to all the other characters, too, such as Elizabeth’s supposedly ‘awful’ mother, who finally seems far less awful to Darcy, and so to the reader. When I finished, I felt as if I had been abducted. I felt I had been transported through a time-tunnel into Elizabeth and Darcy’s lives two hundred years ago. I was an invisible visitor, following them around, and impatient to know what would happen next. When I came back to January 2015, I wondered melancholically how marriage and relationships between men and women had changed so much. If romantic love and how it comes about and evolves can be explained, this novel comes very close to doing so. By the way, there must be a sequel. I hope Lara S. Ormiston writes one, because I need to go back and see how they coped with the challenges their marriage would no doubt face. If you’ve read Pride and Prejudice, you’ll love it. If you haven’t read Pride and Prejudice, you’ll love it, too. If you love historical romance, you’ll love it. If you love novels that deal with relationships between men and women, within and between families, you’ll love it. If you love psychological dramas, you’ll love it, too. If you’re a Jane Austen fan, or if you like 19th century novels, or historical romance, see my review of Captain Frederick Wentworth’s Persuasion by Regina Jeffers, another fabulous retelling of a Jane Austen novel. I might have a problem with very little plot and very little action – you know I’m a mystery type person. But clearly you enjoyed it! Yes, it’s very intense. I think I need to read something with a little action now! Any recomendations? Light and fluffy,lots of action or hot and heavy 😉 ? I just finished reading Two Rivers by Zoe Sadiaa for Rosie, historical fiction. I will post my review this week so you can check it out!